The Customisation and Compatability are just lies, most of the rest are semi-plausable depending on how you think, But if IE8 already comes with all the features you want in firefox from addons, then I'd be using IE8 right now, the only thing keeping me on firefox is Adblock Plus. But it doesn't have a equivalent to InPrivate Filtering. That's why they lumped InPrivate Browsing and Filtering together. What I find funny is that they claim IE8 complies to Web Standards, yet they claim it is compatible with the majority of websites. Which is contradictory. 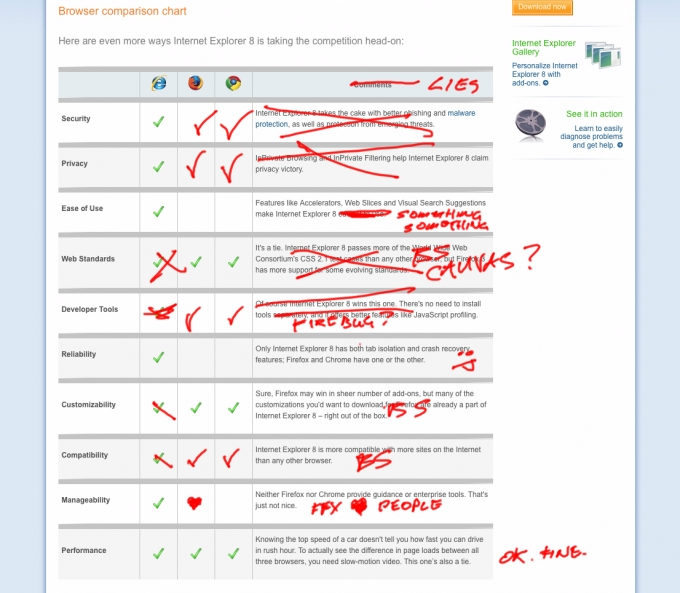 So, I end up with a part time compliant browser with IE8's compatibility mode? It boasts adherence to Web Standards, yet only when it feels like it. Wow. This is quite possibly the worst piece of marketing I've seen in years from such a big company... unless you want to count that guy that was talking about Forza Motorsport 3 at E3 this year, he completely ruined it. Internet Explorer and Web Standards? Which version did they use? 8 doesnt use them. At security, Firefox is better of course, I dont know about Privacy, but I never find the "delete cookies" button in Internet Explorer, but always in Firefox..., Firefox is easy to use, Chrome is even easier. I told about web standards already. Firefox has a "Crash recovery feature", it just never appears because FF never crashes. I guess the point "Manageability" is correct without Addons in firefox, but im not sure. "Performance" is a total lie, I need about 35 sec. to start IE and then 20 to open the first website, everything is in "slow-motion" then. IE always loads up faster than Firefox for me but that's certainly not nearly enough to get me to switch. Chrome is apparently the leader when it comes to security. I have had Chrome crash on me quite often, Firefox occasionally crashes but I usually run the major beta/RC releases along with beta plugins so...the recovery feature works quite well! I can make a full list of reasons I would use IE here. 4. It certainly seems faster than Firefox to me, but I have tons of add-ons loaded into Firefox. I think IE8 was a huge update in all sorts of manners, I was considering switching back for a few months but I just couldn't do it. The non-availability of all the add-ons I use in Firefox (Firebug, ABP, Weave) and the lack of certain easy to use buttons for viewing/saving pictures and background pictures and other various things make it an inconvenience. I have to admit that I've always hated the way Firefox handles downloads, I feel like I'm intelligent enough to handle them on my own and have wished that I could have some sort of add-on to make the downloads more like IE...the lack of a "Run" button when downloading executables is hugely annoying. Tools > Delete Web History > Check the options you want.